By the time Toto was invited to play the famed Montreux Jazz Festival in 1991, their success had already been assured. Having established themselves in the ‘70s as an elite band of session players-turned-chart toppers, they were in the midst of a European tour when the call came. It was an appropriate fit. Not only were they able to spotlight their two most prominent hits of the time -- “Africa” and “Rosanna” -- but they were also allowed to express a more progressive posture that would come with their next album, 1992’s Kingdom of Desire. In short, the band were in peak prowess. Sadly, this marked one of their final appearances with drummer Jeff Porcaro, who died the following year. 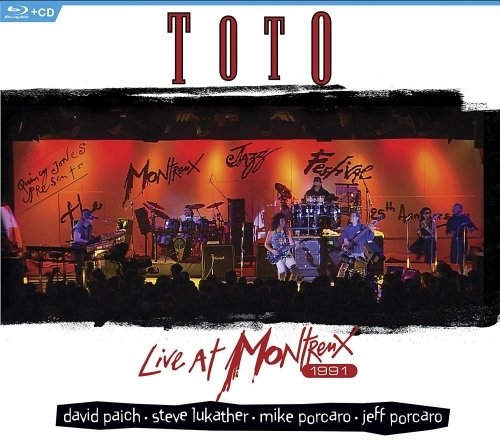 But as Live at Montreux 1991 demonstrates, the core band -- Pocaro, his brother Mike on bass and mainstays, singer/guitarist Steve Lukather and keyboard player keyboardist/vocalist David Paich -- were in prime form. Covers of Jimi Hendrix (a stunning “Red House”) and Sly and the Family Stone (a rousing take on “I Want To Take You Higher”) play side by side with songs of a more progressive posture (“Kingdom of Desire,” “Jake to the Bone”), demonstrating a versatility and prowess that’s not always as evident on the hits. In short, Live at Montreux 1991 spotlights a band that’s still one of the most prolific outfits working today. This CD/DVD offers an insight that fans will appreciate and newcomers will admire. Be assured, it’s well worth the acquisition.